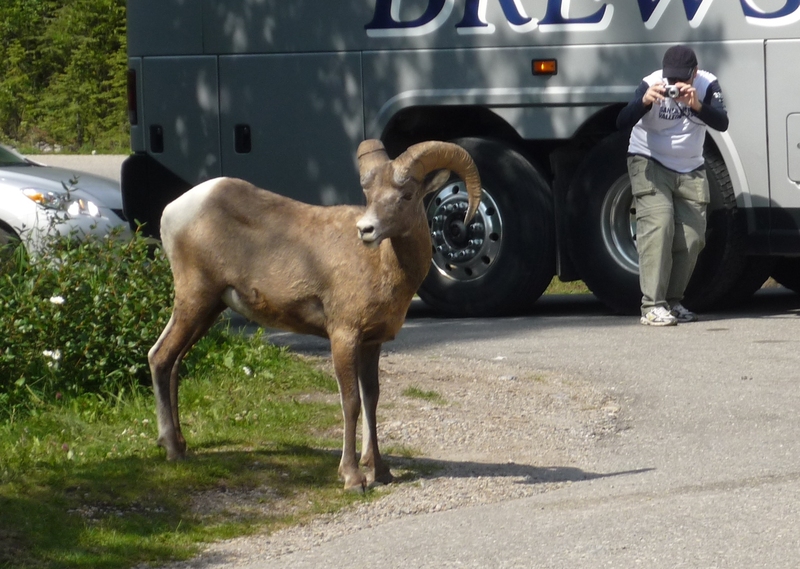 12 noon we were all on the bus to Maligne Lake. 12:30 – more sheep at a road turnout. More photos. 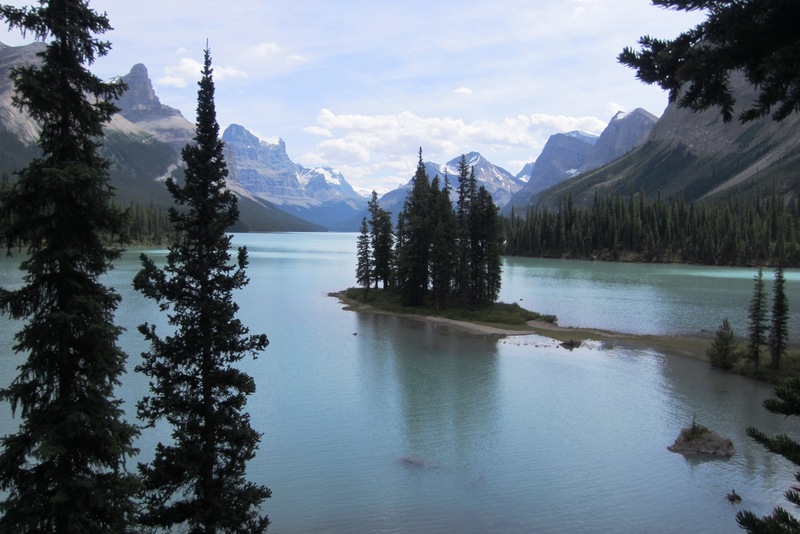 1:30 – on a boat tour of Maligne Lake. This interglacial gem was put onthe Canadian maps by a woman who had lost her 20-years – older husband and both parents, within a short space, wanted to get away from her life, came to Jasper and married her 20-years-younger tour guide, a “Meti” (half Indian, half Anglo) who led her to Maligne Lake. (“She was a cougar!” says tour guide Mark). We take a boat tour out to the Photo Opportunity which makes all the post cards – a little island with a small grove of pine trees just off the shore. (See the Opportunity above). 3:30: Bus back to Jasper lodge. 4:45: we blow off a lecture on Rocky Mountain wildlife adaptation strategies and go swimming. 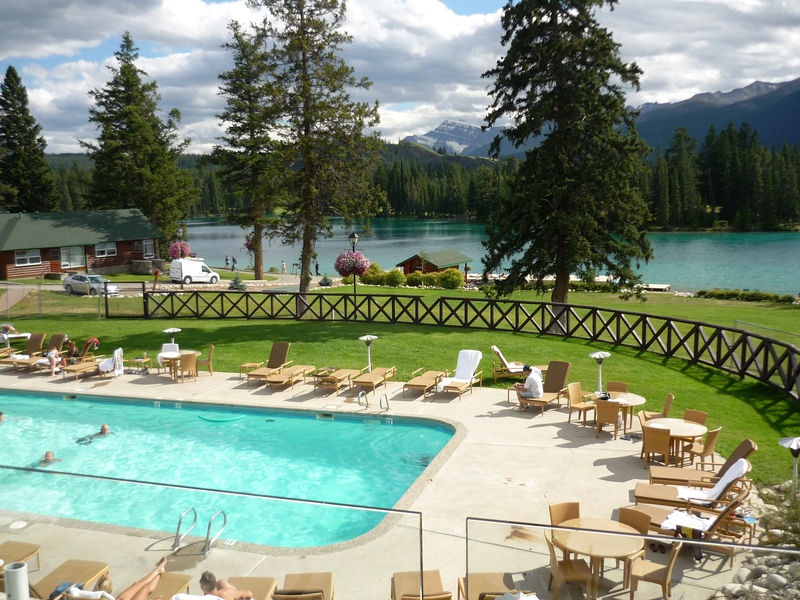 The Lodge includes a lovely 88 degree pool with lots of sun, not too many children… very QUIET – no one lecturing or asking questions, blessed peace. 5:45: We leave the swimming pool,return to our little cabin/haven to dress leisurely for dinner. Dinner is outside on the deck with a 180-degree lake and mountan view, fresh air and all the outdoors to dissipate the chatter of conversation. 9PM: The deck is the place to be, with the lake still glimmering, the late summer sun still loaning a glow to the sky, and a storm visibly gathering, with clouds billowing grandly as if to belittle the mountains’ puny pretensions. The wind picks up; the mosquitoes are gone, the stars are playing hide and seek beyond the clouds. I have to keep reminding myself: It’s probably not this perfect in February. But for now – Wow!